The calendar year 2012 was filled with many notable moments of accomplishment, celebration and reflection at the University of Notre Dame. Here are some of the significant happenings. Haley Scott DeMaria, the 1995 Notre Dame alumna who made an inspiring recovery from critical injuries suffered in a tragic 1992 bus accident involving the Fighting Irish swimming team, urged the class of 2012 to embrace a life on gratitude and challenged the graduates to celebrate the blessings of their lives, even during the darkest times, at the 167th University Commencement Ceremony on May 20. Michael J. O’Brien, a political science major from St. Charles, Ill., delivered the valedictory address and the Laetare Medal was awarded to Ken Hackett, former president of Catholic Relief Services (CRS). The University’s MBA program ranked No. 1 for ethics in the Bloomberg Businessweek MBA Specialty Ranking. The ethics ranking was released as part of the publication’s 2012 Best B-Schools Ranking, where the MBA program landed at No. 20, improving four slots compared to its 2010 result. The 2012-13 Notre Dame Forum, “A More Perfect Union: The Future of America’s Democracy,” featured a series of events throughout the academic year that explored profound questions about the state of the U.S. political system and its capacity to deal with the rapidly changing domestic and international challenges it faces. A September panel discussion titled “Conviction and Compromise: Being a Person of Faith in a Liberal Democracy” featured notable speakers including Rick Warren, founding pastor of Saddleback Church. Ten faculty members were named fellows of the American Association for the Advancement of Science (AAS) in honor of their efforts toward advancing science applications that are deemed scientifically of socially distinguished. The University announced new doctoral program in sacred music and anthropology. 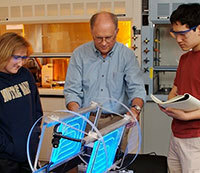 The University received a five-year, $6.1 million award from the National Science Foundation to support the continuation of the nationwide QuarkNet program, which uses particle physics experiments to inspire students and provide valuable research, training and mentorship opportunities for high school teachers. The University entered into a collaborative relationship with the Cleveland Clinic for joint development and commercialization of medical innovations. Groundbreaking ceremonies were held on June 15 for the Notre Dame Linked Experimental Ecosystem Facility (ND LEEF), a research facility that is a partnership between the University and St. Joseph County Park. The field-based environmental research facility will allow Notre Dame scientists, graduate and undergraduate researchers, visiting scholars and other academic institutions to study the interrelationships of land, water and wetland ecologies in the face of environmental change. Research by Timothy Judge, professor of management, revealed that people who are considered ambitious attend the best colleges and universities, have prestigious careers and earn high salaries, but they don’t necessarily lead more successful lives. A study by Notre Dame biologist Beth Archie and colleagues revealed that high-ranking male baboons are less likely to become ill than other males. The finding is surprising, given that top-ranked males also experience high stress, which should suppress immune responses. Research by William Evans, a health and labor economist, found that in the first two years following the death of a child, there is a 133 percent increase in the risk of the mother dying. Research by Kevin Bowyer, Schubmehl-Prein Family Chair in Computer Science and Engineering, found that the iris, long assumed to be a “stable” biometric over a person’s life, is susceptible to an aging process that causes iris recognition technology performance to degrade slowly over time. Notre Dame will open a new center for the arts and culture in January in a renovated historic building, bolstering a growing museum district just west of downtown South Bend. Located in the former Hansel Center, the Notre Dame Center for Arts and Culture will house the University’s Community Relations Department, its Crossroads Art Gallery and the Segura Fine Art Print Studio — a renowned print studio formerly based in Arizona. As part of a new plan for South Bend’s Northeast Neighborhood, a major mixed-income, single-family residential housing development is taking shape on a 13.4-acre site north of State Road 23, south of Eddy Street Commons and east of Eddy Street. The collaboration among Notre Dame, the city of South Bend and the Northeast Neighborhood Revitalization Organization (NNRO), the “Triangle Housing Plan” includes a mix of 53 new market-value (70 percent) and affordable (30 percent) homes. Notre Dame has been named with distinction to the 2012 President’s Higher Education Community Service Honor Roll in recognition of the role it plays in solving community problems; achieving meaningful, measurable outcomes in the communities it serves; and placing students on a lifelong path of civic engagement. Notre Dame is one of four Indiana colleges and universities to be selected with distinction. The Corporation for National and Community Service releases the Community Service Honor Roll annually. Members of the Robinson Community Learning Center LEGO I-Robotics team earned a once-in-a-lifetime opportunity to travel to Germany from June 1 to June 10 to compete in the FIRST LEGO League Open European Championship. Sixty-six teams from more than 40 countries participated in the three-day event. The nonprofit organization FIRST (For Inspiration and Recognition of Science and Technology), an international program that challenges students to develop presentations and design and program LEGO robots, tasked participating teams this year with finding ways to prevent food contamination. The Robinson Center team researched the problem and decided to focus on the issue of fish being damaged in transport. In collaboration with corporate partners and local community organizations, the University of Notre Dame offered a pilot Innovative Thinkers Camp for two-weeks this summer to encourage local youth to pursue individual achievement in academics and areas of future career interests. Participating Notre Dame departments were Community Relations at ND Downtown, the Hesburgh Libraries, Multicultural Student Programs and Services, TRiO and the Robinson Community Learning Center. After a five-month review process, Notre Dame President Rev. John I. Jenkins, C.S.C., accepted recommendations from the Office of Student Affairs to expand and enhance the support of and services for students who identify as gay, lesbian, bisexual, transgender and questioning (GLBTQ), including the creation of a University-recognized student organization. For the fourth consecutive year, Notre Dame received honor roll distinctions as one of the top 10 higher education workplaces in the country in the Chronicle of Higher Education’s annual “Great Colleges to Work For” survey. A new sculpture park on the southern edge of the Notre Dame campus was constructed in a wooded, 8-acre dell that lies between the Irish Green and the Compton Family Ice Arena. The new park is a project of Notre Dame’s Snite Museum of Art and the office of the University Architect. The top-ranked and undefeated Notre Dame football team will take on Alabama in the BCS Title Game Jan. 7, 2013 at Sun Life Stadium in Miami. For Notre Dame, it marks the first time any institution has been ranked number one in the NCAA Graduation Success Rate football standings (at 97 percent) and also played in the BCS Championship Game. Meanwhile, Notre Dame graduated 99 percent of its student athletes in all sports—the top figure for the sixth straight year. The Notre Dame women’s basketball team made it to the NCAA Division I Championship Game, falling to top-ranked Baylor 80-61. The top-ranked men’s soccer team concluded its season with a 17-4-1 record, the most wins for the Fighting Irish since 1988, following a double overtime loss to Indiana in the third round of the NCAA Men’s Soccer Championship. Meanwhile, the women made it to the NCAA Quarterfinals, but suffered a hard-fought 1-0 loss to the top-seeded Florida State Seminoles. Nine athletes with Notre Dame ties competed in the 2012 Summer Olympics that were held July 25-Aug. 12 in London, England. This year’s contingent continued a legacy of Notre Dame participation in the Olympics that goes back 100 years to the 1912 Summer Games in Stockholm, Sweden. Notre Dame continues to rank among the leaders in Academic All-America honors with two more Notre Dame student-athletes receiving Capital One/CoSIDA Academic All-America citations during the 2011-12 academic year. Notre Dame currently stands second all-time with 223 Academic All-Americans, trailing only Nebraska’s 299, but well ahead of third-place Massachusetts Institute of Technology’s 189 honorees. Since 2000, Notre Dame’s 97 selections is second only to Nebraska’s 112 selections. 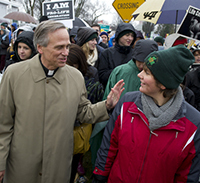 Father Jenkins joined some 350 students, faculty and staff from the University who travelled to Washington, D.C. on Jan. 23 to take part in the 2012 March for Life. The annual march, which marks the anniversary of the Supreme Court’s 1973 Roe v. Wade decision legalizing abortion, has drawn increasing numbers of people over the years, and this year, the 39th anniversary of the decision, Notre Dame’s was among the largest march contingents from any college or university in the country. The Institute for Church Life (ICL) hosted an international conference on the theology of Pope Benedict XVI March 25-27. The conference, which included many Notre Dame theologians and philosophers, gave rise to a book, “Explorations in the Theology of Benedict XVI,” which ICL director John Cavadini presented to the Pope in person Dec. 12. Notre Dame welcomed a number of high-ranking Church leaders to campus, including Archbishop Jean-Louis Bruguès, O.P., secretary of the Vatican’s Congregation for Catholic Education, who gave the Keeley Vatican lecture March 22, and Archbishop Carlo Maria Viganò, the Vatican’s ambassador to the United States, who was among the speakers at the ICL’s Seed of the Church Conference on contemporary Christian martyrdom Nov. 4-6. Originally published by Public Relations Staff at newsinfo.nd.edu on December 27, 2012.